Sometimes watching the Legislature feels like running on a hamster wheel. After five years of the fiscal crisis taking center stage, it really does feel like we’ve been through every solution, every data point and every presentation possible. Yet, despite how interminably dull it is, we are obliged to discuss the budget until all of our eyes and ears bleed because until we figure it out, nothing else matters. The Legislature holds the purse strings, as it is written, though one couldn’t be faulted for thinking it’s the other way around. Governments and legislatures around the world set their policies around what they can afford. But Alaska, as the tired saying goes, is different. Regardless of the oil tax structure, Alaska’s revenue ebbs and flows with oil prices. And it isn’t just annual revenue available for appropriation that fluctuates with oil prices, it’s also the value of the Alaska Permanent Fund. Until recently, the value of the Permanent Fund was more theoretically, than practically, relevant. But with government now being funded from its earnings, it behooves all Alaskans, and legislators to consider the fund’s value, and the effect of policy decisions on it, as a part of the annual budget debate. Unfortunately, Governor Michael J. Dunleavy’s State of the State, and his budget director’s recent testimony before Senate Finance, have given us precious few details with which to deduce what direction they are heading. History, however, gives us some idea how things may proceed over the next few months as we try to answer the question of how a $1.6 billion dollar deficit will be met. It is thanks to that wisdom that we have survived the past five years. Beginning in 2014, and every year since, the Legislature has drawn on savings to fund a deficit of some sort. By 2015 it was clear multi-billion dollar deficits were becoming a permanent fixture. In 2014, the CBR had a balance of $10.1 billion and the SBR had a balance of $5.4 billion. Today, after funding deficits year after year, the Legislature has burned through more than $14 billion, the SBR sits empty, and the CBR contains about $2 billion needed for emergencies or unexpected circumstances. But in the 2018 session something happened. 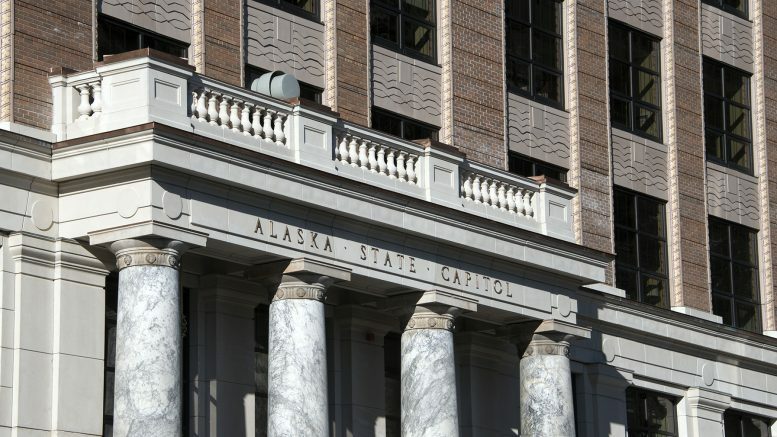 The Legislature was finally able to pass a bill “restructuring” the Alaska Permanent Fund and draw from the fund’s Earnings Reserve Account (ERA) to fund government. Hallelujah, the deficit had (pre-Dunleavy budget) shrunk to a manageable $300 million to $800 million with an infusion of $2.7 billion from the ERA to stabilize the operating and capital budgets. So, where’s the compromise? Where’s the middle ground that’s needed to pass a budget and leave Juneau this year? The path forward, unfortunately, is likely a continuation of history. The bill to restructure the Permanent Fund didn’t pass because everyone in Juneau suddenly agreed on a path forward, you see. With traditional savings accounts depleted, legislators were left with two options to fund the deficit: draw from the fund in a sustainable, rules-based fashion, or just start mad-grabbing at the ERA with no structure in place. Voters in mind, legislators passed the same bill (parts of which they subsequently ignored) that they’d been debating for years at that point. But today, even with a sustainable Permanent Fund draw in place, we must still fill an enormous gap. As Legislative Finance Division Director David Teal pointed out, the deficit is creeping in on us slowly but surely. Rep. Knopp’s caucus demands, Dunleavy’s laughably unserious cuts, and the public comments of legislators are coming together in what I’m calling a Nightmare Scenario. For FY20, about $2.9 billion will be drawn from the Permanent Fund Earnings Reserve Account per the restructuring bill passed in 2018. The budget fights will produce endless headlines, long floor sessions, maybe a million amendments (go for the gold this time! ), and some overflowed tempers. Ultimately, the debates will come down to a few hundred million dollars, as they always do, for things like education, Medicaid, and Alaska Marine Highway System funding. Depending on which way the caucuses go, they will reduce/increase/hold the budget at around $4.8 billion give or take a hundred, or two hundred, million dollars with a fully funded PFD. After much pearl clutching, the Legislature will appropriate an additional $1.4 billion-ish from the Alaska Permanent Fund’s Earnings Reserve Account to plug the FY20 deficit, failing to agree on new revenue or deep cuts (sound familiar?). Depending which way our luck goes, we may get a super-sized PFD this year, an appropriation that will cost the Earnings Reserve an additional $2.3 billion. It’s possible that, this year alone, policy decisions could lead to pulling between $4.3 and $6.6 billion from the ERA. New revenue will be loudly pooh pooh’d as it always is right through FY21, or the 2020 session. Thousands of lines will be written, exactly the same as these, extolling the fiscal lunacy of destroying the Earnings Reserve, our only real “savings” account left. But, because there is still money to be had, another deficit of, let’s say, $1.6 billion again, will be pulled from the ERA for an FY21 approximate draw of $2.9 (POMV) + $1.6 (deficit) = $4.5 billion. Cumulatively, that brings us to a two-year draw of possibly nearly $9 billion to $11 billion from a fund that currently contains $16.6 billion. Let that sink in. Within two years, we could nearly decimate the only remaining cash the state has. 2019 is 2015 déjà vu. Faced with a massive deficit, the Legislature looks likely to shirk its responsibility and take the easy way out, once again, because of a failure to compromise. Only when the ERA is a husk of what it once was, and dividends are truly and honestly at risk, will real debate over how to fund government move forward. Now, look, this was called a nightmare scenario for a reason. Things aren’t all that bad, right? PFD payback seems unlikely to move forward after listening to co-chairs of Senate Finance Natasha von Imhof and Bert Stedman, both of whom pledge to defend the Alaska Permanent Fund vigorously (don’t they all). Unlike most, though, they have the power to do it. So, let’s cut $2.3 billion, the cost of old dividends, out of the nightmare scenario for a total two-year draw of about $8.8 billion. With returns, that gives us, conservatively, about two more years of the ERA being able to bear the weight of state government, deficits and PFDs. What happens then? New revenue and/or reduced PFDs won’t be a choice at that point—they’ll be a reality because we simply won’t have any other options. But maybe that’s always been what it took. The ERA is much more than a savings account. It is an investment account, invested in exactly the same way as the rest of the Alaska Permanent Fund. At a 6.25% return with no contributions, $8.5 billion-ish of ERA spending outlined in the nightmare scenario would grow to more than $14 billion in 10 years and $36 billion in 25 years if kept in the market. Take it out now and it grows to nothing. Every penny pulled from the ERA today compounds many years into the future and acts, as budget commentator Brad Keithley likes to say, as a tax on all Alaskans and, in this case, a tax on many future generations. Continuing down this path means we are eating the seed corn that was supposed to sustain us into the future and we risk damaging the fund for years to come. The Permanent Fund was built up to its current, staggeringly impressive $64 billion because policy makers left money managers alone to do what they do best. Now, as we embark on a new Permanent Fund funded future, let us take extra care to ensure we manage our impressive wealth well. Be the first to comment on "Alaska’s budget could be headed for a nightmare scenario if legislators keep taking the easy way out"